Knowing basic math facts is important for future math success, and there's no such thing as too much practice. 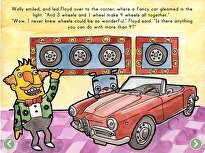 Looking for another way to get your child learning his basic addition facts? Play Ice Cream Addition! 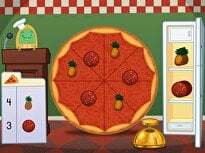 Here's a math game to keep you and your child school cool during this hot summer. All you need is dice, the ice cream worksheet, and some crayons! Roll the dice, add up the terms, and color in all the pieces of your ice cream cone to win. Ice Cream Addition is a great game to play in pairs or small groups, and can help your child learn some math vocabulary while boosting his basic addition skills. 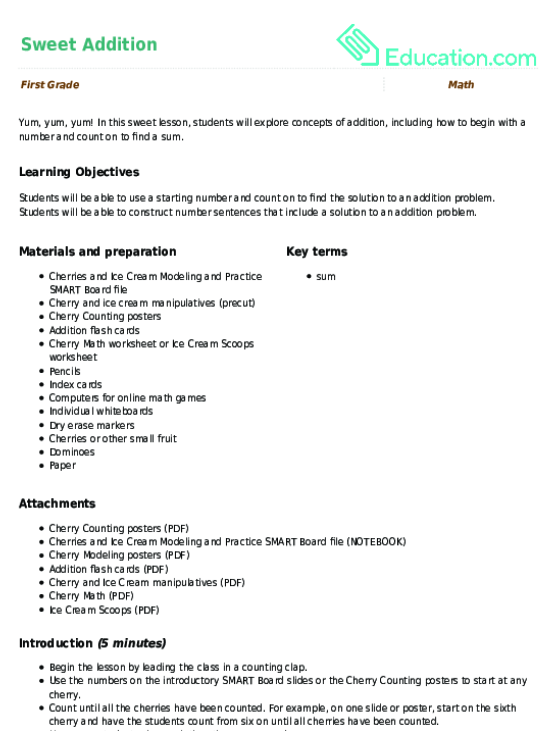 Print enough copies of the Ice Cream Worksheet so that every player has one. Determine who goes first. The first player will roll the dice. 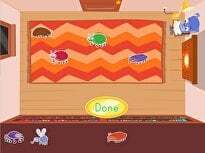 On a blank sheet of paper, the player will then write the addition problem out using the numbers he rolled as the addends. If he rolled a 3 and 4, for instance, he would write the problem this way: 3 + 4 = 7. The first player will then color the sum on the ice cream cone. In the example 3 + 4 = 7, 7 is the sum and would be colored on the cone. The next player rolls the dice to determine his addends, writes the addition problem, and colors in his sum. Continue playing with each player taking turns. If someone rolls a sum that is already colored on his sheet, he loses that turn. Try to use the math vocabulary as you play this game and see how quickly you learn these new words. The first player to sum up all his problems and color in his entire ice cream cone wins the game! Celebrate by eating some real, delicious ice cream for a treat! 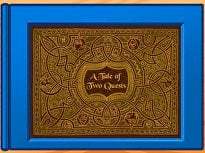 Guided Lessons are a sequence of interactive digital games, worksheets, and other activities that guide learners through different concepts and skills. They keep track of your progress and help you study smarter, step by step. Guided Lessons are digital games and exercises that keep track of your progress and help you study smarter, step by step. Understanding that addition means putting together and subtraction means taking away is an important building block for young mathematicians. 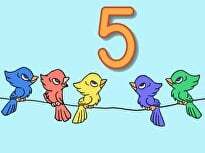 This guided lessons helps preschoolers master this concept, focusing on addition and subtraction within 5. Having a firm grasp of addition and subtraction is crucial for math fluency. Don't forget to check out the addition and subtraction printables that help to extend learning after the lesson is over. Understanding that addition means putting together and subtraction means taking away is an important building block for young mathematicians. This delicious treat is color coded with different equations that your child can practice solving as he colors the layers of this delicious ice cream cone. How much will it cost to buy a hot dog and an ice cream cone? 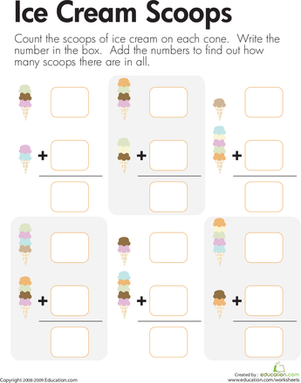 This fun first grade math worksheet uses ice-cream scoops to help kids practice counting and single-digit vertical addition. 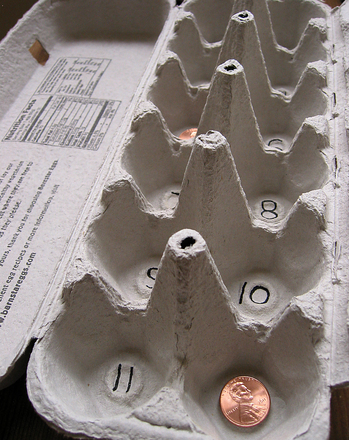 Using just an egg carton and some beans or pennies, you can play this game with your first grader and see real gains in core math skills. Math can be yummy, especially when it's all about ice cream sundaes! 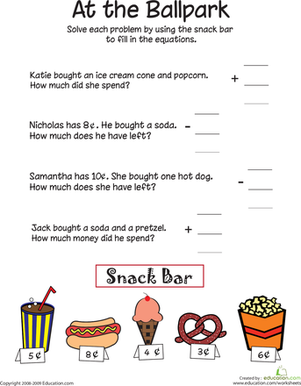 Introduce your first grader to word problems with this sweet worksheet. In this sweet lesson, students will explore concepts of addition, including how to begin with a number and count on to find a sum. Make math fun with some basketball addition. Your child will get to work on his addition facts (single digit addition equations). Soon he'll be an all-star! The best way to learn addition is to visualize it! Get some fun practice with beginning addition. Spring into addition with these twenty addition problems! Support your 1st grader's math skills with this one-digit addition practice worksheet. Prepare for an addition feast! Your child will practice her addition facts, simple one-digit addition equations. Time to start fishin' for addition! Here's a great worksheet to help your child practice his simple addition and counting. Time to start fishin' for addition! Here's a great worksheet that will help your child practice his simple addition and counting.